Self-diagnosis is portrayed as the psychological equivalent of looking up exotic diseases on WebMD, but really, it’s a healthy process that leaves people with mental health problems more empowered. So why are people so against it? I think anti-self-diagnosis rhetoric is based on a series of misunderstandings. Self-diagnosis is not the same as an off-handed comment. For example, someone saying “Yeah, my books are in alphabetical order– I’m kind of OCD about it” is not the same as someone revealing that, after lots of careful thought, they think they have OCD. It can be kind of tough to tell the difference sometimes, but it definitely exists. There are no laboratory tests for mental illnesses. Say you think your finger is broken and you go to the doctor. You report your pain, but your doctor also has an x-ray done and reveals that your finger is, in fact, broken. Everyone agrees it should be put in a cast. However, there’s no laboratory test for even the most common mental illnesses. So how does psychological diagnosis work? Diagnosis relies on the self-reporting of symptoms, which people really can understand and report accurately. When you have a broken leg, you might report the pain, which is an important part of the diagnosis. With mental illnesses, you’re self-reporting every aspect of the disorder. This involves a couple of steps: realizing you have a problem, researching that problem, checking your experience against the symptom, and finally making a decision. For example, you might begin by realizing that not everyone has constant, life-altering fatigue. So you research it and find out that it’s commonly an aspect of depression. Depression? You agree that you feel sad a lot of the time, and often have thoughts of suicide, so you go to the doctor and report all this, and probably get a diagnosis of depression in return. This means that even when you have a doctor’s help, a large part of the diagnosis process rests on you. Not everyone can access healthcare to get an official diagnosis. Assuming you have insurance (which is not a given) wait times for doctors can be essentially infinite, leaving you to fend for yourself in the meantime. 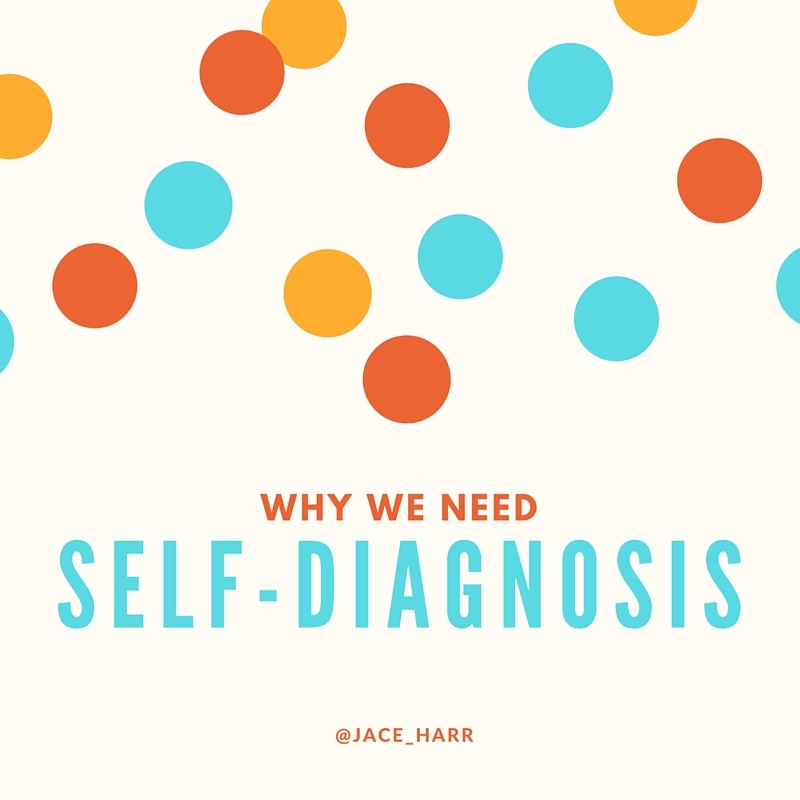 However, self-diagnosis doesn’t mean that there are no professionals involved. Professionals may unofficially diagnose, or agree with a self-diagnosis. For example, my therapist doesn’t believe strongly in diagnoses, so she gave me a very vague one to appease the insurance company while still exploring my symptoms. Now, she would diagnose me with something very different. Other professionals won’t officially diagnose more “severe” mental health problems due to the accompanying stigma that the patient may face. Professionals almost always under-diagnose. When you see a general practitioner, you will almost always come away with a diagnosis of depression and/or anxiety. Many people with less common disorders, like Dissociative Identity Disorder, go through a variety of professionals before someone diagnoses them accurately. The right diagnoses don’t always exist, even when they should. I am an enthusiastic advocate for the inclusion of Complex PTSD in the DSM, but as yet it hasn’t happened. That means that the diagnosis that accurately suits me, and has helped me grow immeasurably, doesn’t officially exist. (The reasons are mainly inter-scientist politics.) Therefore, a professional diagnosis is always going to be slightly inaccurate. The point of a diagnosis is to get better and/or learn to manage your illness, and a self-diagnosis can do just that. People can use a self-diagnosis to find a community and coping skills that they may not have had access to otherwise. For example, someone’s self-diagnosis of Borderline Personality Disorder might lead them to find Dialectical Behavior Therapy techniques that they can practice on their own or with guidance. Please feel free to comment with your thoughts!